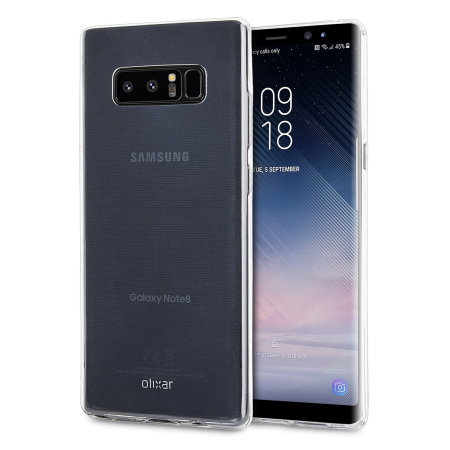 This ultra-thin 100% transparent gel case from Olixar provides a super slim fitting design, which adds no additional bulk to your Samsung Galaxy Note 8. Offering durable protection against damage, while revealing the beauty of your phone from within. I'm a believer in "you get what you pay for" and that adage remains true for this product. I needed a temporary case while the one I wanted was being delivered. I liked the idea of a clear case and didn't want to spend too much money for a temp case. There are what appear to be wet smudges on the inside back even though I wiped the case and back of the phone dry several times. Also, the case fits but not very snugly - probably because of the flex of the material. Pretty much as advertised and the case wasn't defective in any noticeable way so I gave it three stars. I like this product a lot but it slips off my phone time to time. The overall look is very nice and it does the job. Am very happy with this case. It's good strong gel/plastic and doesn't add much to the overall phone in terms of extra feel. Haven't dropped the phone yet thank-god but if I did am pretty sure it would protect against chips etc. Also it doesn't let dust/crumbs etc in like a lot of the cases do, which they go onto to scratch the phone on the inside of the case. Excellent value for the price imo. Looks great protects phone just as good. This case is so slim that you can't even notice it's on, it's screen protector friendly and works really well with my Whitestone Dome glass screen protector. Very good case to protect note 8. I love clear case for awesome Note 8! I ordered it before phone came out and they kept giving me updates! Didn't need to do that cuz I didn't have a phone yet. Came almost immediately after phone came out, quick delivery! Will order from them again. I have the new Note 8 and I wanted a case that was thin and clear to show off the beauty of the phone yet still protect it and make it easier to hold (not so slippery). This case is perfect. It fits the phone like a glove and all the necessary cut-outs are there and perfectly shaped. It doesn't interfere with the S-Pen and works well using Samsung Pay. Add to that the more than reasonable price and fast delivery, you can't find a better deal anywhere! If you are looking for a minimal case I highly recommend this one.